run expectancy | That's a Clown Hypothesis, Bro! A few people kicked around some suggestions about my last piece on Tom Tango’s blog, so I’m following up with a couple more pieces of analysis that will hopefully shed some light on things. As a quick refresher, I looked at steal attempts with runners on the corners and found that the success rate is much larger than the break even point, especially with two outs. My research suggests teams are too conservative, i.e. they should send the runners more. For more about methods and data, look at the prior piece. One initial correction from Tango is that I was treating one class of events improperly; that’s since been corrected. (Specifically, two out events where one runner is out and the other scores are now counted as successes, not failures.) Another point made by Peter Jensen is that I should consider what happens when the runners are moving and contact is made; that’s going to require a bit more grinding with the data, but it’s now on my list of things to look at. Next, there were some questions about how much of the success rate is due to having abnormally good or bad runners. 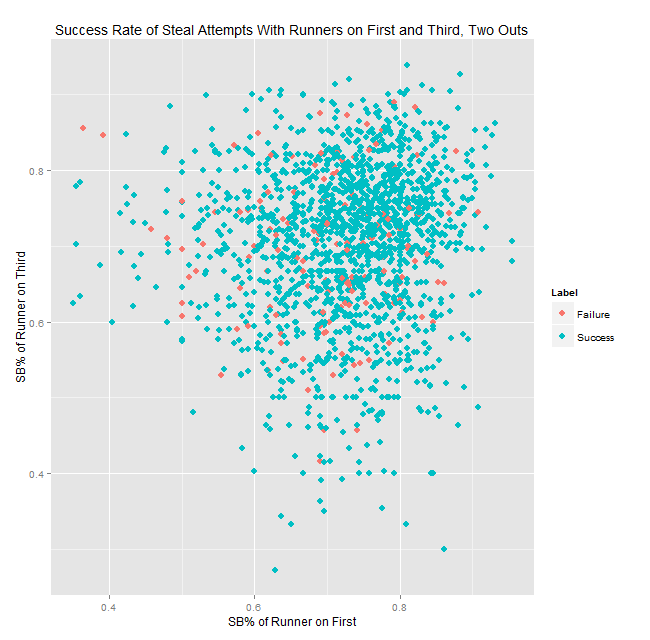 Here are two plots showing all successes and failures by the stolen base percentages of the runners on first and third. The first is for all situations, the second for two out situations only. Quick data note: to compute attempts and stolen base percentage, I used a centered three-year average, meaning that if an attempt took place in 2010 the SB% fed in would be the aggregate figure from 2009–2011. 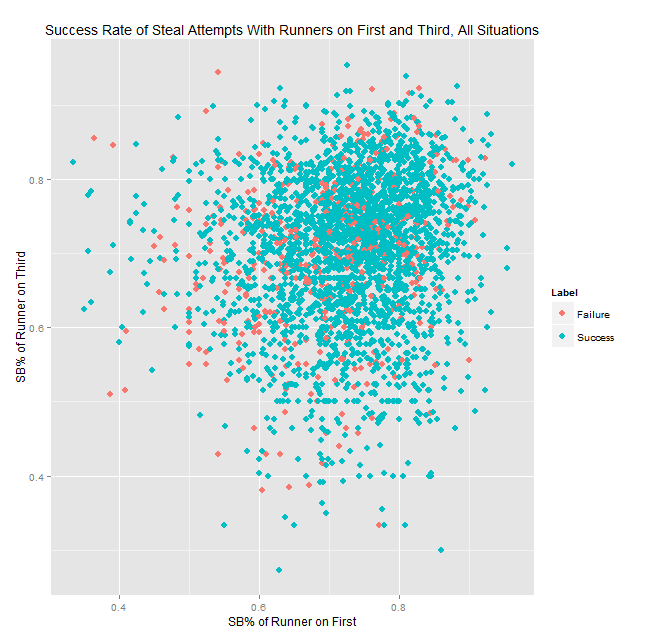 These charts only include situations where both runners have at least 20 attempts. To simplify the charts a bit, I put the attempts into one of 36 buckets based on the SB% of the runners and then computed the success rates for those buckets; you can see the results in the tables below. The bucket boundaries are based on the distribution of SB%, so the 17th, 33rd, 50th, 67th, and 83rd percentiles. Sample sizes are roughly 55 for two outs (minimum 40) and 100-110 overall (minimum 73). As you can see, even with noticeably below-average runners at both bases (average SB% is 70%), teams are successful so often that they should be trying it more often—all buckets but one in the two tables have a success rate above break-even. (BE rates are 75.5% overall and 69% for 2 outs.) There’s still a little bit of selection bias, which is pertinent, though I don’t think it accounts for most of the effect—see the note below. However, the fact that every single bucket comes in well above the break-even rate suggests to me that even accounting for the selection bias, this is still an area where managers should be more aggressive. At the very least, it seems that if there are two average base thieves on and two out, the runner on first should be going much more frequently than the current sub-10% attempt rate. Note: One important thing to consider is that putting the attempts minimum in place noticeably increases the success rate—from 83% to 86% overall, and from 90% to 92% for two out situations. (The explanation for that is that really slow players don’t necessarily have poor SB%, they just have next to no stolen base attempts, so they are falling out of the data.) However, if you stick to the attempts where one or both runners have few attempts, the success rate only drops about 2 percentage points, which is still pretty far above the breakeven point overall and with two outs. This entry was posted in Baseball, Research, Strategy and tagged baseball strategy, Retrosheet, run expectancy, stealing bases on June 15, 2014 by clownhypothesis.